Apple was today forced to delay the sale of the iPhone 4S smartphone at its flagship Chinese retail store in Beijing after huge crowds braved the cold weather and swamped the area, eager to get their hands on the Cupertino-based firm’s newest smartphone. Queuers began waiting late on Thursday, led by scalpers and others looking to resell the device on for profit. Lines became unruly during the early hours of Friday morning, with China’s SWAT team later called out to the scene in case things got nasty, as MacRumours explains. Apple was scheduled to release the device at 7:00 am this morning, however — at the time of writing — it is yet to open its Beijing store for sales. According to Business Week, angry Apple fans pelted the Sanlitun store with eggs after a man with a bullhorn told the crowd that the device would not go on sale today. Business Week was unable to verify the man’s identity, and it is unclear whether he was an Apple staff member, and whether the device will actually be sold in Beijing today. Apple Insider reports that several individuals were led away by security after becoming frustrated when the store was not opened on time, during which profanities, egg pelting and shouts of “open the door” rang out. There were no serious problems at Apple’s other three stores in China, as customers were able to get their hands on the new device elsewhere in the country. Queuers at the Pudong store — which was the first Apple Store in Beijing — were let in to the store on time as it opened at 7:00 am. The device is available through operator China Unicom, which is introducing of the first subsidised device in the country, although it is initially restricted to long-term, $45 dollar tariffs. While that is likely to be too expensive for many, it could be the start of more affordable devices in the country. Apple is tipped to soon offer the device through China Telecom. Given the popularity of the phone, the operator is likely to pick up new customers, however it is may well have already lost significant ground on China Unicom, after its rival went first with the new Apple smartphone. 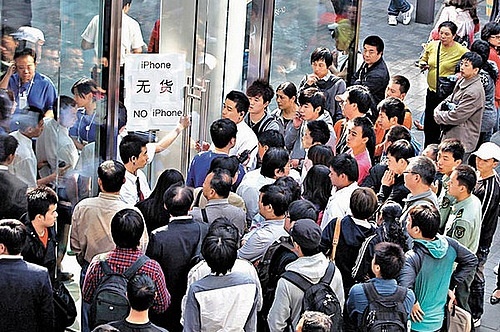 The iPhone 4S launch in Hong Kong was also marred by crowd trouble, as scalpers and a large number of Apple fans caused chaos amongst massive queues around the Apple Store. 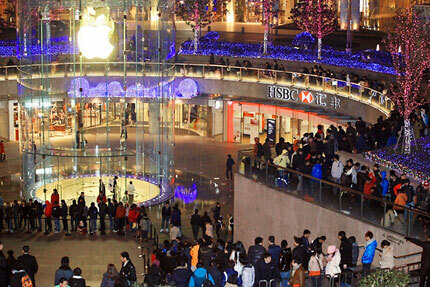 Update 2: Chinese website Sina Tech reports [via Penn Olson] that Apple has closed the Sanlitun Apple Store in response to the reaction that it got when it announced that its opening would be delayed. As of now, it is unclear when it will reopen, however devices can be bought from other stores in the country and also online via China Unicom. Update 1: The Shanghaiist is claiming that the launch has been cancelled by Apple due to fights between scalpers. The blog cites a Weibo posting [in Chinese] from the Shanghai Morning Post as its source.